With Singing in Mind, based in Kendal, uses music and rhythm to encourage communication between people with neurological conditions and their families and carers. 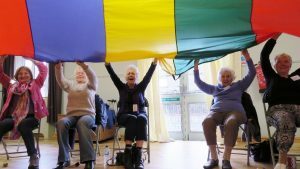 The group received £3,500 from the Comic Relief Fund to continue providing the weekly sessions, which are full of warmth, fun, laughter and delight, repetition and variety, hard concentration and socialising. Communication through singing can help with articulation, concentration, focus and motivation for people suffering with conditions such as Motor Neurone Disease, Dementia, Stroke, and Parkinson’s. The two-hour sessions run every Monday at Kendal’s Hallgarth Community Centre and are led by experienced professional facilitator, Ali Rigg. They include refreshments, singing and gentle aerobic exercise such as throwing balls and armchair exercises. Set up in 2015, With Singing in Mind provides a vital life-line in re-connecting its members with their families and carers. Sarah Bingham, a support worker for one of the members, has seen how important the session are: “I have noticed a huge amount of difference and personal growth in the other members who attend. There are several gentleman who go with their wives who at first appeared unaffected by the group.